I’ll preface this by saying that crashes aren’t something most cyclists want to think about. They’re not an inevitability, you should always take reasonable safety precautions and be prepared to learn ways of improving your cycling skills. However, the longer you cycle and the more aggressively, your odds of an incident or two will increase so you should be prepared for dealing with a crash. They’re not exactly an enjoyable experience but more often than not, the damage to the ego is greater than that to the body. There’s a number of ways you can minimise the long term impact to both, starting with how you treat the accident scene. The first thing that can be done to improve your recovery, once you’ve accepted that you’re on your way down is to avoid putting your arms out. Instinct compels you to try and catch yourself but this will not be of great help when falling from a bike, especially at speed – outstretched arms can lead to a broken arm, collarbone or a dislocation. The generally accepted, best thing to do is keep your grip on the handlebars firmly but not locked and tuck your head. This minimises the odds of the most common breaks and head injury. Now you’re on the ground; it’s time to engage your brain. You should try, without moving to assess whether you’re in immediate danger from other vehicles or cyclists – if you’re travelling with a group, hopefully your bunch mates will be on top of this for you. If you’re in a race, it’s likely that you’ll be waiting on a support vehicle. At the same time, you’ll need to gauge your capacity to move. If you don’t believe you have any serious bleeding, breaks or spinal injury then you should try to carefully remove yourself and bike from the road as soon as possible. No need to rush, but be aware that you want to maximise your visibility to other road users to lessen the risk of a secondary accident. If you’re with friends or bystanders and feel that you can’t get out of the road, ask for help if it’s due to jelly legs or a sprain, otherwise ask them to control the road while medical assistance can be called. If you’ve been able to move out of the road, you should start an injury assessment. Inspect anywhere you feel pain first, ranked by most painful, have a witness help if possible. Make sure you can move your fingers and toes. Inspect your helmet for damage, if it’s broken you should pay extra close attention for symptoms of concussion and consider being checked by a professional. If you are unable to move fingers or toes on a limb, you should immobilise it and call an ambulance. Consider your options for transport and treatment (if required). If you have friends or family that can help pick you and the bike up, that’s a great option. Consider that shock might actually convince you that you’re less injured than in reality, this is why a lift is a good choice. You should be planning to travel to a place where you can treat any injuries appropriately. Road rash, sprains and bruises can be treated effectively at home or at the roadside if appropriate gear is available and you’re familiar enough with these injuries. If in any doubt, you should seek medical help. Any internal pains, suspected breaks, soft tissue tears or large wounds should see you at the emergency department. This is a one stop shop that can have you examined by X-Ray, cleaned and stitched and referred for anything more serious. If help isn’t imminently available to get you there or if you’re unable to move from where you’ve landed then an ambulance should be called. 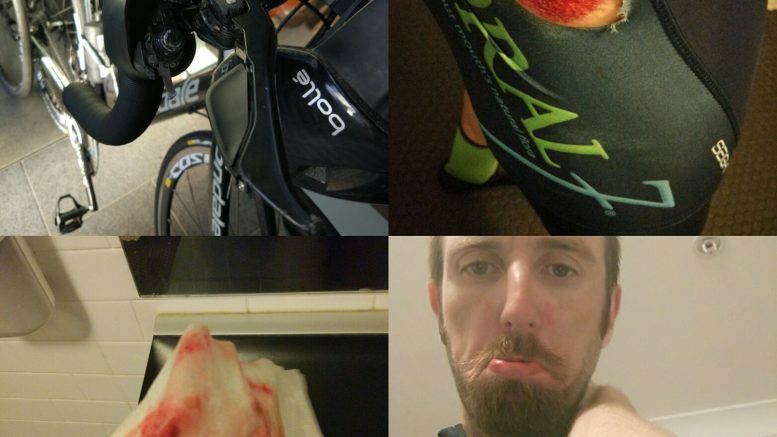 It’s critical that you check the bike, I can tell you from experience that impacting existing bruises and road rash is not something you want to do. If you’ve been able to get a lift, then ensure the bike is fully inspected before you ride it next. Be the first to comment on "Dealing with a crash"